The Church On Wheels Carts are some of the most useful purpose built carts available to church planters. Our clients normally describe them as some of the coolest carts they have ever seen. All Church On Wheels Carts are made of high quality American steel and polyethylene. The corners are solid steel that are folded, stamped and coated in our facilities. The shelves are laser cut 14 gauge steel, and can hold up to anything. Some of our carts have a skin or outer shell, that skin is made of High Density Polyethylene and is scratch resistant. All standard height carts use 6" casters that are rated at 1,500 pounds, and the smaller carts use 3.5" castors rated at 600 pounds. To top it off we only use Heavy Duty Aircraft nuts and bolts to secure everything in place. Each cart has a specific list of features so check them out below. Every standard size cart starts with a solid steel base made of one piece of 14 gauge steel. The steel is laser cut and folded to increase strength and stability in the carts. Welded to the base is a 1,500 pound 6" caster. 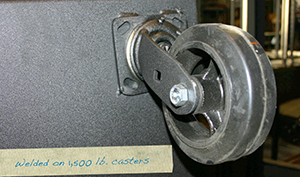 These casters are heavy duty solid rubber with greased bearings. We chose to use caster this large and this strong because we know these carts are going to be loaded in and out of a trailer, down a ramp , over curbs, over thresholds, maybe through grass every week. We have seen other rolling racks or cases with smaller wheels screwed on just break off while being used and end up damaging equipment or hurting people. We have never had a caster fall off a cart from every week use!! Many of our mobile carts have an outer shell that we refer to as the "skin" of the cart. This skin is made of a solid piece of High Density Polyethylene similar to the skin on a road case. This Polyethylene has properties that make it virtually scratch proof. We also, put on every cart a solid plastic bumper in the corners. The bumper and skin are act as a protective shield for the cart keeping them looking good and lasting for years. Some churches have even had graphics installed directly on the skin and created mural with multiple carts. The shelves in every Church On Wheels cart is not solid steel with reinforced corners. These doubled corners provide exceptional cart strength and stability. One of the greatest things about the shelves in our carts is that they are bolted in, this means you can adapt the cart to anything you may need down the road. While other custom made carts or rack are built specific to every item being loaded and can not change with out destroying the whole cart, we believe that the carts should be able to grow like your church. If your equipment changes 6 months down the road you can simply move a shelf up or down to accommodate, opposed to buying a completely new cart.